Terrorist release list includes several who murdered children, unarmed captives. On Saturday it was confirmed that Israel’s government plans to release 104 Palestinian Authority-resident terrorists from prison as a “gesture” to PA Chairman Mahmoud Abbas. New reports have also confirmed rumors that the list will contain several terrorists responsible for some of the most horrific attacks of the 1980s and 1990s. The full, official list of terrorists to be freed will not come before the government Sunday. Rather, the government will vote to free unspecified terrorists, and the list of individuals to be freed will be confirmed by a smaller ministerial committee – allowing Prime Minister Binyamin Netanyahu a forum more likely to approve the “gesture” despite the killers’ notoriety. On the list are Mahmoud Salam Saliman Abu Harabish and Adam Ibrahim Juma'a-Juma'a, who in 1988 murdered 26-year-old schoolteacher Rachel Weiss, her three young children, and a young soldier. The two hurled firebombs at a civilian bus, sending it up in flames; Weiss and her children ages 3, 2 and 9 months were unable to escape. Soldier David Delarosa died trying to save them. Also on the list is the terrorist who committed a similar murder the year before. The 1987 firebomb attack on a family car killed pregnant Ofra Moses and her young son Tal Moses. Father Abie Moses and three other young children were badly burned but survived. The murderers of Moshe Tamam and Tzvi Klein are to be freed as well. Tamam was kidnapped and murdered. Klein, a father of three, was shot and murdered in 1991 as he drove home from work. 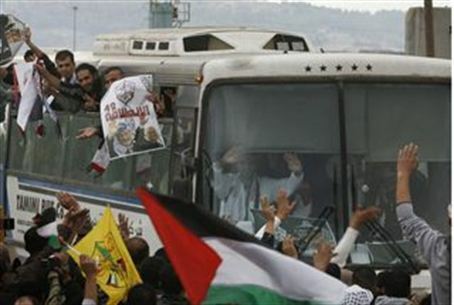 The government originally planned to release 82 prisoners in an effort to keep Abbas at the negotiating table. However, PA leaders added a demand that Israel free 24 Israeli Arabs serving prison time for terrorism.